Farewelling Australia's last, and the world's oldest sloth, Miss C.
Adelaide Zoo is celebrating the life of one of its most iconic and oldest residents, Australia’s last sloth, Miss C the Hoffmann’s Two-toed Sloth. The difficult decision was made to humanely put Miss C to sleep late on Friday, 2 June, as her quality of life deteriorated due to age-related health issues. Adelaide Zoo Curator of Conservation and Native Fauna Dr Phil Ainsley said at more than double her life expectancy, Miss C had a number of age-related health conditions and was found on Friday morning by her keepers looking visibly unwell. “Miss C truly was a phenomenal creature and believed to be the oldest of her kind in the world,” Dr Ainsley said. “The treatment Miss C required was very invasive and would likely only delay the inevitable so the hard decision was made to humanely euthanise her. Born at Adelaide Zoo in 1974, Miss C was an important part of Adelaide’s Zoo’s history and was dearly loved by staff, volunteers and visitors. “We were extremely lucky to have called Miss C a member of our Adelaide Zoo family for so long,” Phil said. “Her long life is a true testament to the stellar care provided by our dedicated zoo staff over the years. “Miss C will always hold a special place in the hearts of our zoo family and will be fondly remembered by all who travelled from near and far to visit our iconic friend. 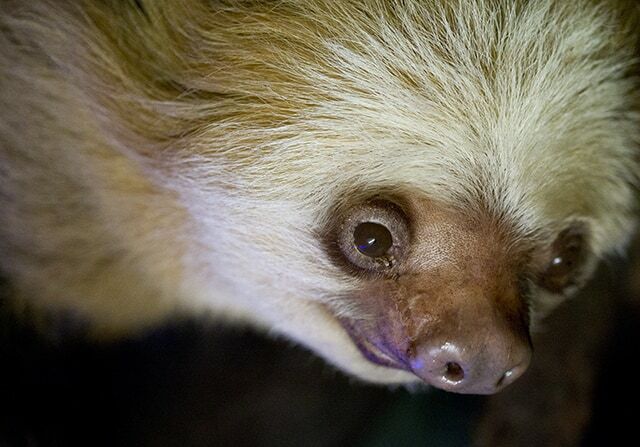 The Hoffmann’s Two-toed Sloth is a solitary, nocturnal and arboreal animal that inhabits parts of Central and South America including Honduras, Ecuador, Peru, Brazil and Bolivia.